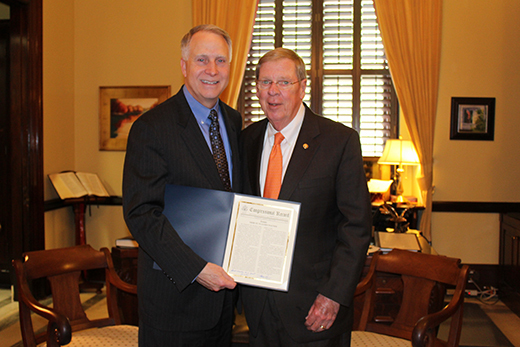 U.S. Sen. Johnny Isakson (right) read a tribute to Emory President James Wagner on floor of the Senate on Monday, April 18, and presented a copy to Wagner during a meeting in his Senate office on Tuesday. Emory President James Wagner was honored this week with a tribute entered into the Congressional Record, the official publication of the daily proceedings and remarks in Congress. U.S. Sen. Johnny Isakson, Georgia's senior senator, read the tribute on the floor of the Senate on Monday, April 18, and presented a copy to Wagner during a meeting in his Senate office on Tuesday. In the tribute, Isakson noted that Wagner would soon step down after 13 years as Emory's president. "I feel I would be remiss if I did not mark some of his achievements at Emory here in the Record, as the success of Emory University and its students has made a difference to our nation," Isakson said. Wagner described the tribute as "a humbling surprise." He is visiting Washington, D.C., this week for the annual Association of American Universities (AAU) presidents’ meeting. In addition to visiting with Isakson, Wagner also met with Sen. Tim Scott from South Carolina; Rep. Kathy Castor from Florida, who is an Emory alumna; and Emory’s own congressman, Rep. John Lewis. Wagner also had the opportunity to introduce House Budget Chairman Tom Price from Georgia at the AAU meeting. Today I am honored to recognize in the RECORD James W. Wagner, a leader at the helm of one of Georgia’s great institutions of higher education, Emory University. After 13 years as president of Emory University, Mr. Wagner will soon be stepping down from his position. I feel I would be remiss if I did not mark some of his achievements at Emory here in the RECORD, as the success of Emory University and its students has made a difference to our Nation. Emory University’s reputation as a private research university that has led in academic, research, and health care eminence extends far beyond its beautiful campus, which is headquartered in the beautiful Druid Hills neighborhood of Atlanta, GA. President Wagner has enhanced the school’s reputation, recruiting a world-class and diverse community of scholars and researchers who have secured an increased number of appointments to national academies and an increased amount of external research funding that added up to more than $570 million in 2015. President Wagner guided the Emory community in developing the university’s first vision statement, which established the foundation for a 10-year strategic plan focused on strengthening faculty distinction, ensuring the highest student quality, enhancing the student experience, and exploring new frontiers in science and technology. President Wagner also led a fundraising campaign that resulted in the investment of $1.7 billion in support of the university’s initiatives in teaching, research, scholarship, patient care, and social action. In short, President Wagner has advanced all aspects of the university’s mission through the innovative design and construction of a number of new facilities to support health sciences research, science education, residential life, library resources, and patient care. I hope that President Wagner and I will remain in touch wherever his next step takes him, and I wish him and his wife, Debbie, the very best.